Lighting is one of the most important aspects of any hydroponics grow room. 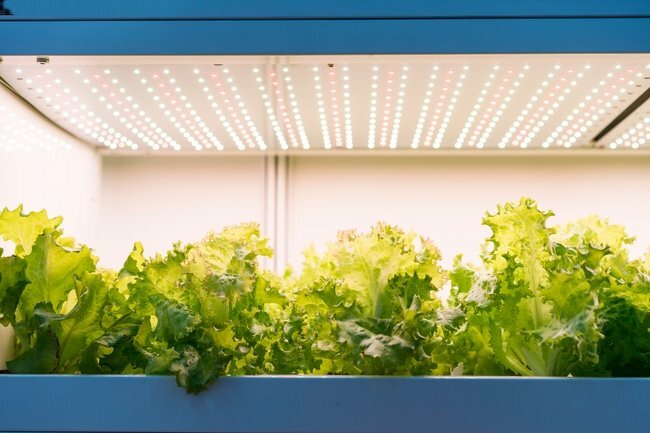 And it is often the biggest expense, considering the cost of investing in a grow light system and the heavy use of lighting, at 12 or more hours a day, every day. But sorting out the dizzying array of grow lighting that’s available is a daunting task, especially if you’re new to hydroponics. So this article will consider two of the most popular systems available today: LED vs fluorescent grow lights. We’ll begin with a short introduction to each type of grow lighting, then run through the pros and cons of each type, followed by a head-to-head comparison of LED vs fluorescent grow lights. LED stands for light-emitting diode. A form of solid-state lighting, an LED uses a semiconductor chip, known as an LED die, that turns an electrical current into photons through a process called electroluminescence. An LED may be configured either as a single-die emitter that’s mounted on a circuit board, or an array of dies mounted directly on a circuit board, which is known as a chip-on-board (COB) module. An LED lamp is made up of an LED mounted to a heat sink, along with directional lenses and a power supply. Today’s LED grow lights are designed to emit wavelengths of light that produce the natural daylight spectrum, or they can be precisely adjusted to put out ideal wavelengths for the varying needs of growing plants. They feature additional cooling systems to increase their efficiency. Fluorescent lamps convert electrical energy into light by running a current through mercury vapor to produce ultraviolet radiation, which stimulates the coating of phosphor powder on the inside of the lamp to fluoresce, thus producing visible light. The color of the light is determined by the chemical composition of the phosphor. Fluorescent grow lights come in two forms: compact fluorescent lights (CFL) and fluorescent tubes. CFL grow lights differ from regular CFLs in that they come in larger sizes, provide higher wattages, and put out a broad spectrum of light.Fluorescent tube grow lights come in different sizes and varieties, although the T5 diameter high-output (HO) grow lights, which emit about twice as much light as regular fluorescent tubes, are widely considered the best ones to use.Fluorescent grow light fixtures typically have built-in reflectors and ballast, which give them a thin profile. Among the many benefits of LED grow lights, the biggest ones are that they are energy efficient and very long lasting. Energy-efficient lighting is an obvious advantage for hydroponic gardening, and LED grow lights are famous for this. Their solid state technology has been a real revolution in lighting efficiency. The impressively long lifespan that LED grow lights offer is also due to the fact that they are solid state, rather than having vacuum or gas components that deteriorate over time. Features such as the built-in heat sink, which pulls heat away from the lamp and dissipates it into the air, also help improve brightness and longevity. Lower running temperatures of LED grow lights are advantageous in hydroponics for a couple of reasons. The first is that lighting that gives off a lot of heat can easily create unacceptable temperatures in the confined space of a grow room, so you need a cooling system, which runs up your electricity bill. The second reason is that a lower heat output makes it possible to place lights closer to the plants. This is important for indoor growing because the farther away from a light source a plant is, the less energy is available to the plant for photosynthesis.Therefore, the closer the fixtures, the better the light efficiency. Another advantage of LED grow lights is that you don’t need a ballast to limit the current, or directional lenses, which send light exactly where it’s needed. Not needing these features saves space and also allows you to avoid the hassle of having to figure out how to assemble your lighting system. Also, you can plug most LED grow lights directly into your regular electrical outlets. Recent LED technology such as COB modules provide growers with highly customizable lighting to fit different growing purposes, depending on the plants and the stage of growth, as well as white LED grow lights that mimic natural sunlight by putting out a broad, well-balanced spectrum that encourages photosynthesis in plants. And with companies manufacturing an increasing range of LED grow lighting features, the benefits of these lights are growing greater as costs are going down. The biggest disadvantage of LED grow lights is their initial cost, which is quite a bit higher than other types of grow lights – although costs are falling and we’re starting to see some less expensive brands on the market. Of course, the high initial investment will soon pay off through the notably lower energy costs and legendary longevity of LED grow lights. But if you don’t have the budget for them to start with, then none of that will matter. The simple fact that so many LED grow lighting options are becoming available means it can all be rather overwhelming, and even disadvantageous. For example, you can find low-wattage LED grow lights that actually put out less light than other types of grow lights. So you really need to do your homework and pay careful attention to brand reputation and track record. Finally, there’s an important issue with LED chips to keep in mind: They’re sensitive to heat. High temperatures can cause them to fail. This is why it’s so important to purchase quality LED grow light fixtures that have the heat sink and fan built in. But heat sinks are heavy, so you need to make sure your ceiling is strong enough to support them, especially if you’re hanging high-powered LED grow lights. There are many advantages to using fluorescent grow lights, with the main ones being that that they offer great energy efficiency and versatility for the money.And while fluorescent grow lights have long been known for putting out a natural light spectrum that’s perfect for encouraging vegetative growth, newer fluorescent grow lights are being produced for other stages of plant growth, as well. Fluorescent grow lights are very popular because of their low cost, both in terms of the initial investment and their daily use. 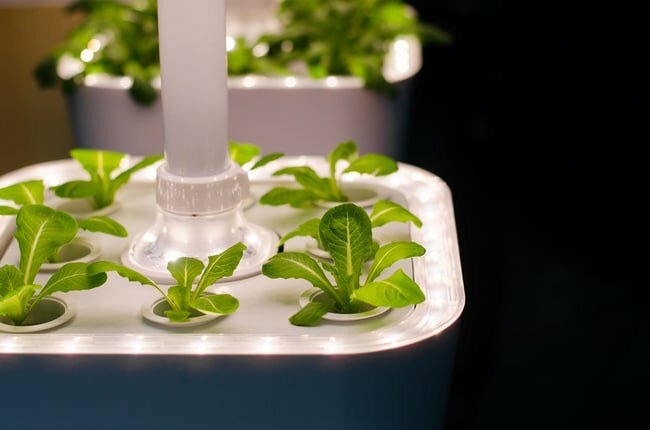 In fact, they are the least expensive type of grow lighting to purchase, making them especially attractive to beginners and hobbyists who want to try getting into hydroponics without having to invest a lot of money. The scalability of fluorescent grow lights may also be an important factor for those who are planning to start out small and then expand the size of their operation. Versatility is another big reason why fluorescent grow lights are so popular. They come in many shapes, sizes, and wattages, as well as a range of wavelengths. With a low heat output, CFLs can be placed very close to plants, hung in various positions, and used as supplemental lighting to ensure that all parts of the plants are getting the light they need. Fluorescent tube fixtures have that thin profile that’s great for tight spaces. And today’s T5 HO fluorescent grow lights can be used for all growing phases of plants, from germination to vegetative growth, flowering, and fruit production. 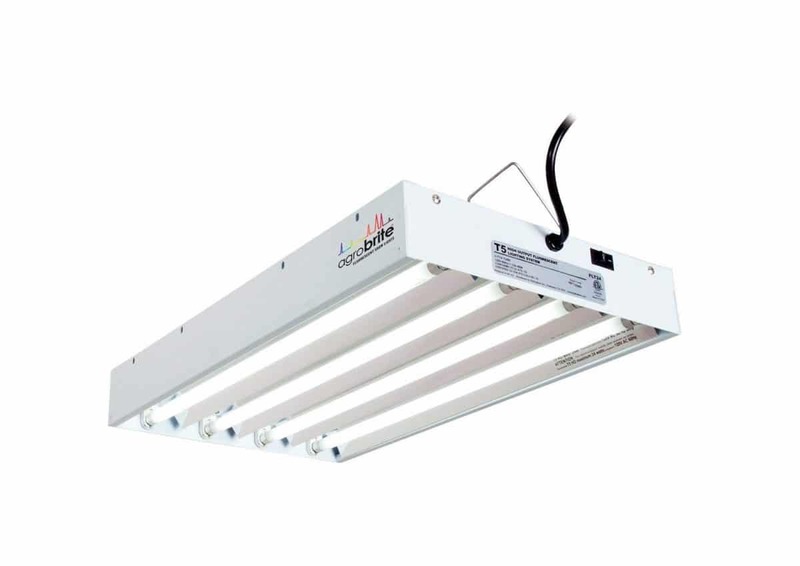 Fluorescent grow lights are also attractive to many hydroponics growers because they’re so easy to use, since they don’t require any special fixtures, sockets, or technical skills, and they’re generally not as daunting to get a handle on as other types of grow lighting that aren’t already familiar from the everyday world. While CFL grow lights are excellent for stimulating plant growth, they’re not so great for the flowering phase, as the light they put out doesn’t have an intensity that mimics late-summer sunlight. High output T5 fluorescent grow lights, on the other hand, are better for most phases of plant growth; but with their high intensity comes higher heat output, which means growers need to be careful about placing them too close to plants as well as having to contend with the potential buildup of heat in their grow rooms. Another downside growers see in fluorescent grow lights is that their usable lifespan is significantly shorter than much of the other grow light technology available today. Additionally, fluorescent lights have mercury in them, which is a toxic heavy metal. Therefore, they present a health risk, since mercury vapor is released when they break, and they also pollute the environment after disposal. 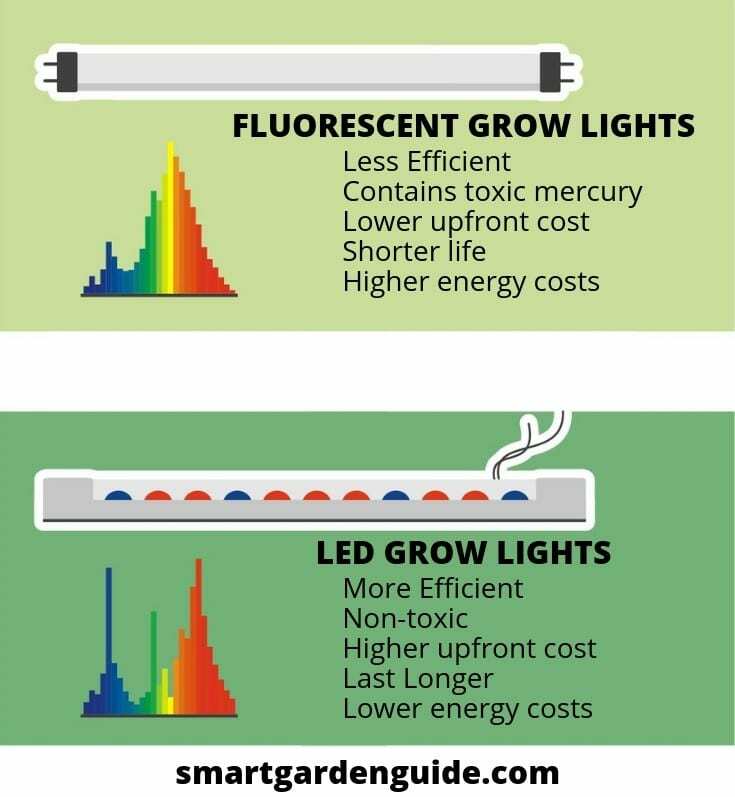 When it comes to energy efficiency, LED grow lights beat out the best fluorescent grow lights, hands down. When comparing lighting efficiency, it’s important to look at the light levels delivered to plants rather than just the electrical watts. A 300-watt LED lamp is equal to a 600-watt T5 fluorescent grow tube in terms of micromole of photons per Joule of energy, thus saving about 50 percent of the light energy required while providing the equivalent level of light. As for a comparison of light energies, some explanation of terms used to describe horticultural lighting is in order, as this can be confusing if you’re new to hydroponic growing. Light wavelength output refers to the colors of the spectrum that are present in the light emitted by a lamp, as measured in nanometers. While sunlight contains the full spectrum of light energy, we humans can only see part of the light energy spectrum. Likewise, the pigments and photoreceptors in plants only respond to certain wavelengths of light. Color temperature offers a sense of the light spectrum in terms of cool colors, which are in the blue range, and warm colors, which are the reds. PAR stands for photosynthetically active radiation, which is the range usable light energy that most plants absorb for photosynthesis. Hydroponics enthusiasts tend to get caught up in the minutiae of light energy and its effects on plant growth. But basically, while fluorescent bulbs are now available that put out a variety of cool, warm, and full spectrum lighting, LED technology enables an unlimited variety of precision outputs ranging from broad-spectrum white light that’s remarkably close to sunlight to lighting that growers can use for intricately specific purposes, such as encouraging basil plants to develop a stronger flavor. LED grow lighting puts off next to no heat, whereas fluorescent grow lamps run cool, yet growers do need to consider the heat put out by fluorescent lighting to some degree, particularly with high output T5 fluorescent lighting. Here again, LED grow lights really outshine fluorescent grow lighting, with LEDs having a usable lifespan of about 50000 hours, as compared to about 8000 hours for CFL grow lights and 10000 to 20000 hours for T5 fluorescents. Although their prices are coming down, LED grow lights are still significantly more expensive than fluorescent grow lights to purchase. However, LED lamps use half the energy that fluorescents use to put out the same amount of light and can last up to eight times longer. So the overall cost of LEDs comes out lower in the long run than purchasing and running fluorescent grow lighting for hydroponic gardening. Which Grow Lighting Should I Choose? So is there a clear the winner in this LED vs. fluorescent grow light comparison? Well, both types of grow lighting have their advantages, but LEDs outperform on most metrics, and they’re coming down in price. My favorite LED grow lights at present are the Viparspectra range. Check out my review of their entry level model here. Ultimately, your decision will be based on the type of plants you will be growing, the amount of light you will need for your grow area, the amount of electricity that your lighting system will consume, and your budget for up-front as well as the long-term costs of running your grow room operation. For hobbyists and home hydroponics growers, fluorescent lighting will continue to be attractive – at least until the price points of quality LED grow lighting come a bit further down – while it makes great sense for anyone who has bigger plans for their hydroponic operation to take the hit and invest in LED grow lights at the outset.